Why "information overload" is the wrong lens through which to consider the issue, or what sugar and fat have to do with Hollywood junk. "You are a mashup of what you let into your life," artist Austin Kleon recently proclaimed. This encapsulates the founding philosophy behind Brain Pickings -- a filtration mechanism that lets into your life things that are interesting, meaningful, creatively and intellectually stimulating, memorable. Naturally, I was thrilled for the release of Clay Johnson's The Information Diet: A Case for Conscious Consumption -- an intelligent manifesto for optimizing the 11 hours we spend consuming information on any given day (a number that, for some of us, might be frighteningly higher) in a way that serves our intellectual, creative, and psychological well-being. In any democratic nation with the freedom of speech, information can never be as strongly regulated by the public as our food, water, and air. Yet information is just as vital to our survival as the other three things we consume. That's why personal responsibility in an age of mostly free information is vital to individual and social health. 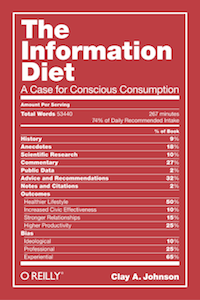 If we want our communities and our democracies to thrive, we need a healthier information diet. He builds on the analogy between food and information by arguing that just like we know we're products of the food we eat, we must understand just how much we're products of the information we consume -- and consume accordingly. Yet the sheer amount of information available to us -- 800,000 petabytes (a million gigabytes per petabyte) in the storage universe and 3.6 zettabytes (a million petabytes per zettabyte) consumed by American homes per day, expected to increase 44-fold by 2020 -- is mind-boggling. Using Google's n-gram viewer, which searches the occurrences of a particular phrase in a corpus of English books from the past 150 years, Johnson points out that the term "information overload" became popular in the 1960s, surging 50 percent by 1980 and then again by 2000. The concept of information overload doesn't work, however, because as much as we'd like to equate our brains with iPods or hard drives, human beings are biological creatures, not mechanical ones. Our brains are as finite in capacity as our waistlines. While people may eat themselves into a heart attack, they don't actually die of overconsumption: we don't see many people taking their last bite at a fried chicken restaurant, overstepping their maximum capacity, and exploding. Nobody has a maximum amount of storage for fat, and it's unlikely that we have a maximum capacity for knowledge. Yet we seem to want to solve the problem mechanically. Turn it the other way around and you see how absurd it is. Trying to deal with our relationship with information as though we are somehow digital machines is like trying to upgrade our computers by sitting them in fertilizer. We're looking at the problem through the wrong lens. It's a matter of health and survival. Information and power are inherently related. Our ability to process and communicate information is as much an evolutionary advantage as our opposable thumbs. Just as food companies learned that if they want to sell a lot of cheap calories, they should pack them with salt, fat, and sugar -- the stuff that people crave -- media companies learned that affirmation sells a lot better than information. Who wants to hear the truth when they can hear that they're right? To aid in that, Johnson has provided a toolkit of helpful (mostly) free software for a healthy information diet on the book's site, ranging from productivity apps to ad blockers to various setting hacks to make your favorite services and social web platforms more conducive to info-wellness.